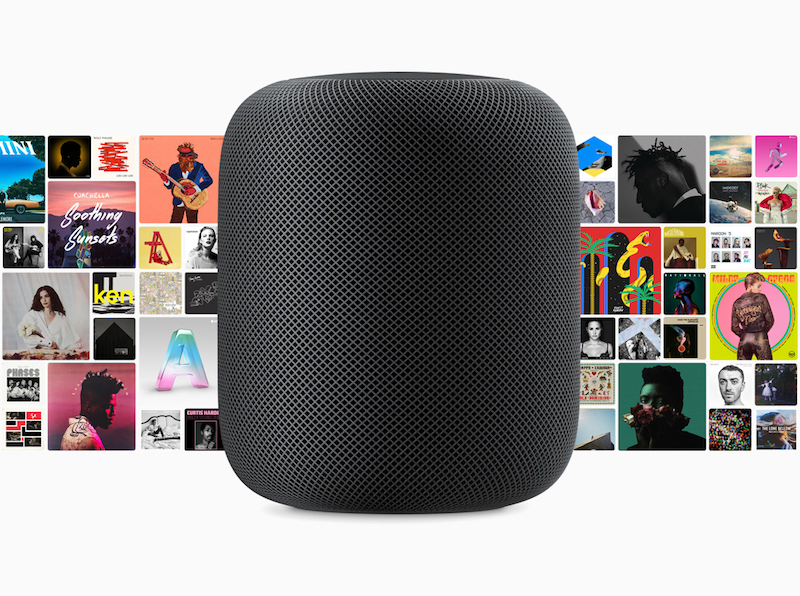 Although longer and more in-depth reviews for Apple's smart speaker, the HomePod, have not yet been published, a few websites have gotten the chance to spend an hour or so with the speaker and have been sharing their experiences this week. At Digital Trends, Julian Chokkattu liked the unassuming design of the HomePod, noting that "it's easy to miss... because it makes no effort at standing out." This should make it easier for the HomePod to blend in with any room's decor, according to Chokkattu. In terms of sound, he got to listen to upwards of five songs from various genres at a volume of about 65 percent, and concluded that it "sounds great" no matter where you are in the room. He also called his brief encounters with Siri on HomePod "fast and seamless," explaining that Siri is smart enough to realize when you're meaning to activate it on your iPhone ("when your phone is in your hand") so that the HomePod does not answer. Audio quality is beautifully warm, yet the bass is not overpowering, even though it was still quite rich. If you close your eyes, it’s easy to feel like you’re at a live performance. We could pick out the vocals and instruments clearly. The speaker allows each instrument to shine through; you can hear precise guitar plucks. No, it doesn’t have that crisp sound you’d hear from very expensive high-end speakers, but then again, the HomePod doesn’t cost thousands yet still pushes brilliant sound quality out of a single, small enclosure. What’s more impressive is how consistent the HomePod sounds wherever you are in the room. Yes, the further away you are, the quieter it is, but not by much. It almost felt like the music was following our movement, and it consistently sounded great. Tech journalist Lance Ulanoff shared his thoughts on HomePod in a post on Medium, and noted that when the sound quality was compared to the Google Home Max and Sonos One, HomePod was "astonishing." Ulanoff echoed a sentiment stated by Chokkattu, detailing a listening experience that felt as if he was hearing the music "in a small café for an audience of me" and equating HomePod's sound quality to a live performance. Although stereo pairing won't be ready at launch, Ulanoff got to experience this as well and said that "two HomePods playing just about anything is incredible." Ultimately, he called HomePod an "ultra-high-quality" speaker that doubles as an "excellent Siri ambassador." Pete Pachal with Mashable was also impressed by the HomePod's sound quality, which he described as an "aural triumph," but was more skeptical on the device and questioned whether or not Apple is too late to the smart speaker market. What I'm less convinced of, however, is whether customers will care. The success of the Echo Dot — Amazon's puck-shaped smart speaker that definitely de-emphasizes the second word of that description — tells me that anyone who's been won over by the category mostly just wants to get the power of voice command in more places. And audio? A glorified intercom will do. Or, hey, just connect your own speakers. Those interested in HomePod can pre-order the speaker on Apple.com in the United States, United Kingdom, and Australia beginning today, January 26, and then the device will launch on February 9. For those on the fence about Apple's entry into the smart speaker market, Sonos today is launching a sale aimed at competing with Apple where you can get two Sonos One speakers for the same price of one HomePod. "equating HomePod's sound quality to a live performance." Put this guy in front of some Martin Logans and his head will probably explode. lol, such hyperbole.
" If you close your eyes, it's easy to feel like you're at a live performance." Stop. Just stop it now. I have Martin Logan Electrostatic floor speakers for right and left and Martin Logan Electrostatic Center Channel speaker for home theater...all speakers require AC power to charge the panels......once you hear this kind of speaker...then any little speaker would sound very small. For some people this Apple speaker is good enough...not for audiophiles. Truly shocking that a $2000 speaker sounds better than a $350 home assistant. Ugh the biggest problem I have is choosing what color. I wanted two, but i want it to match by other devices. Problem is I have a silver iphone X (256GB) and a space grey ipad pro (10.5), plus a space gray iMac Pro... not to mention my stainless steel (black) watch. So I ordered two HomePods in White, and two in Space Gray. I'm hoping that will cover my living room sufficiently. Depending on which color is nicest, I'll order more to place in the other rooms. And the refugees from Syria think they have problems. In terms of sound, he got to listen to upwards of five songs from various genres at a volume of about 65 percent, and concluded that it "sounds great" no matter where you are in the room. He also calledhis brief encounters with Siri on HomePod "fast and seamless," explaining that Siri is smart enoughto realize when you're meaning to activate it on your iPhone ("when your phone is in your hand") sothat the HomePod does not answer. These aren’t reviews. A review is someone having the device for more than an hour and able to play whatever they want on it. Please keep us updated. I won't sleep well until I've been briefed on your possessions. Lmao wow not gonna lie. This post sounds... Uh... Rich. These reviews are enough to make the Apple base snap these up. Does the HomePod sound better than the competitors? Yes. Is the Siri integration useful? Yes. Is the design good? Yes. The only question left unanswered is, will people buy this? Given Apple's track record, I think that the answer is an easy Yes. - Will the HomePod support multiple user accounts? No. This is enough to cause some of us to hold off and wait to see where this goes. I'm an audiophile and it's plenty good enough for me. Do you have Martin Logans in your kitchen? Den/office? Bedroom? Rec room? Do you refuse to listen to music when you're in any other room except your listening room because the sound isn't "good enough" for your ears?